Robin Mackay, James Trafford, Luke Pendrell. Robin Mackay, Pete Wolfendale, Amanda Beech. 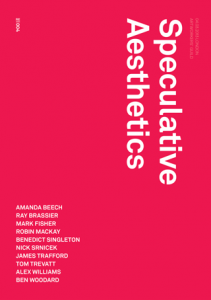 Short panel presentation for the launch of the book Speculative Aesthetics, as part of a Speculative Tate programme devised by James Trafford and Luke Pendrell, co-editors of the volume.